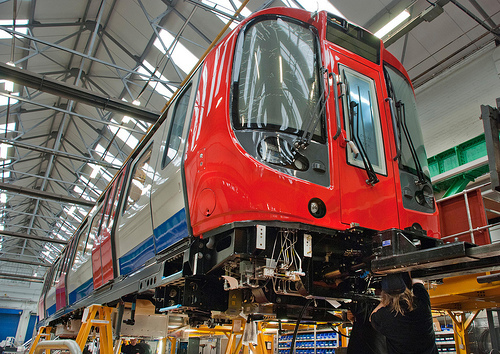 Come along to see photographs from behind the scenes at the UK's only train building factory, where the good people of Bombardier are building new tube trains for London. You can talk about pictures online, upload them, leave comments and Google further details, but how about seeing them in-person? That's exactly what you'll be able to do from tomorrow evening. The graduating shows from many of the photography courses round the country are happening in the next few weeks at the Old Truman Brewery in London's Brick Lane, and the whole graduating class (including me) will be there. As part of the Free Range set of shows, it gives us a chance to showcase our final project in a proper gallery setting and invite along a wide range of industry people to ask questions, critique and offer advice. The exhibition runs from Friday 22nd until Monday 25th June (Friday- Monday 10am - 7pm and Monday 10am - 4pm), is free and has a wide range of photography on display. I'll be displaying the Bombardier Derby and London Underground Neasden S-Stock project, entitled, 'At London's Service'.